UCC loves hockey. We’ve been on the rink since 1888, joined the Ontario Hockey League in 1899 and won our first championship three years later. Today, many of our players have gone on to accolades at the college and even NHL level. And our teams are fiercely respected by other independent schools in their leagues. A major landmark in our history was the opening of the William P. Wilder ’40 Arena and Sports Complex in 2009. With Olympic- and NHL-sized rinks, our hockey program has been strengthened with increased student ice time and unsurpassed facilities. At the Prep, from SK to Grade 4, boys are taught skating skills as part of the physical education curriculum. The focus on is on mastering strokes, speed, stopping, starting and, ultimately, mastering their blades. Hockey teams begin in Grade 5 and go through to Grade 7 (U11, U12 and U13). Practices are held two to four times a week at the Wilder Arena. Boys get to play about 20 games a year. UCC’s excellent, experienced hockey coaches focus on developing individual skills. The emphasis is always on sportsmanship and fun in a competitive environment. The Prep hosts the annual Boyd Caldwell Invitational Hockey Tournament each year in early January. Teams from all over Quebec, Ontario and New York are invited and billeted with our boys. 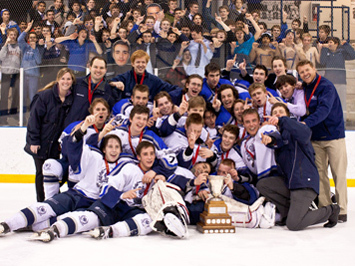 All Prep hockey teams also attend an away tournament. Past destinations have included Montreal, Boston and Europe. At the Upper School, boys play on either the U14 or U16 teams or — depending on their skill level, regardless of age — the junior varsity or varsity team. The junior varsity team has weekly practices and is for boys who have excellent skills but may not have the time commitment or skill level for the varsity squad. Playing junior varsity allows boys to play outside school, for example, on a Greater Toronto Hockey League team. At the varsity level, the focus is on developing university-level players. Coaches work with boys during practices three times a week and assess and correct game strategy twice a week. Boys hit the ice nearly every day from November through to the March break. Players have supplementary skills sessions two mornings a week in the fall and supplementary skills or power skating twice a week in the spring. There’s also a summer workout program. UCC’s varsity team plays in five tournaments and hosts one. Three of the tournaments are in the United States, where the boys are exposed to National Collegiate Athletic Association hockey programs and games.